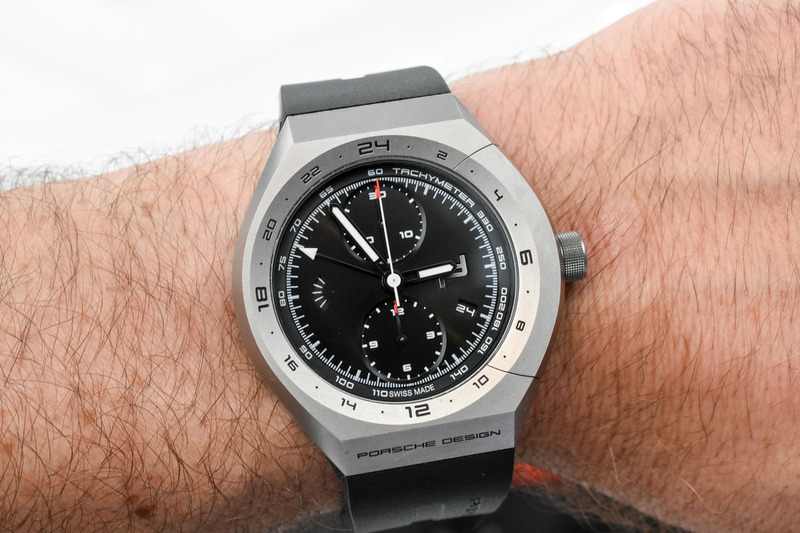 Over the last few years, Porsche Design has come out with several interesting new models, like the stealth-looking Chronotimer Series 1 and the classically understated 1919 Globetimer. Both demonstrate Porsche Design’s ongoing commitment to high-quality engineering, combined with pared back technical design. This trend continues in 2017, with the launch of the Monobloc Actuator 24H-Chronotimer, officially unveiled at Baselworld earlier this year. Join us as we review this remarkable new watch in-depth. When it comes to longevity in the luxury watch industry, innovation is the name of the game. It’s not enough just to create nice looking watches, you must innovate to stay relevant, whether it be improvements to the internal mechanics, using new and exotic materials in the case and dial construction, or simply coming up with entirely new ways of doing things. 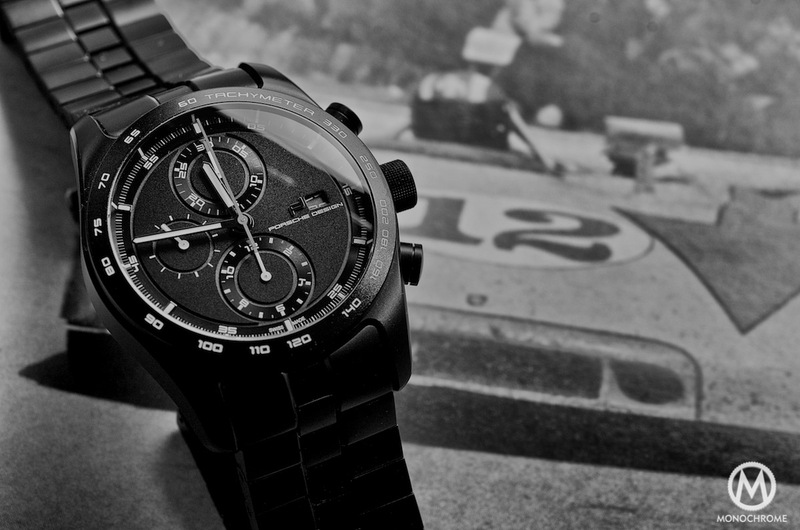 Porsche Design has always understood this concept, which is why the company created the world’s first ever titanium chronograph with an integrated titanium bracelet (in collaboration with IWC), all the way back in 1980 – read this story about the original Porsche Design by IWC Titan Chronograph for more background info. 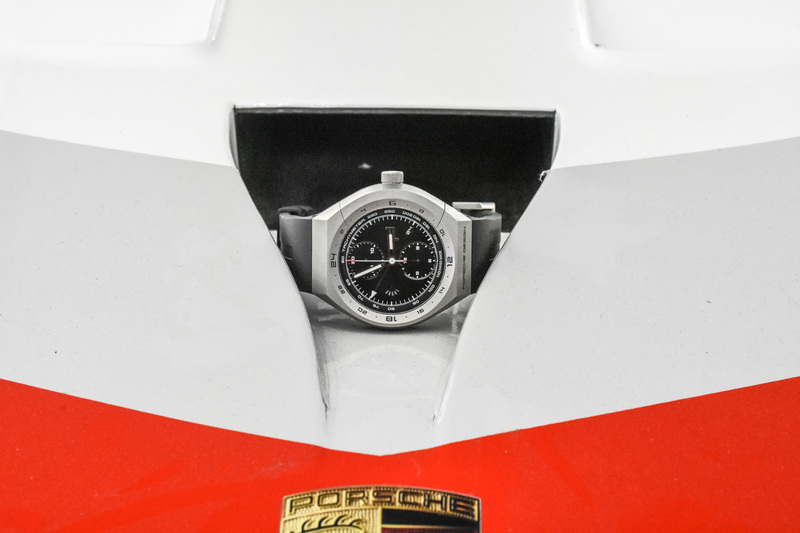 Many innovations have followed since, all of which have been inspired by the world of motor racing, a world that Porsche Design is inextricably linked to. 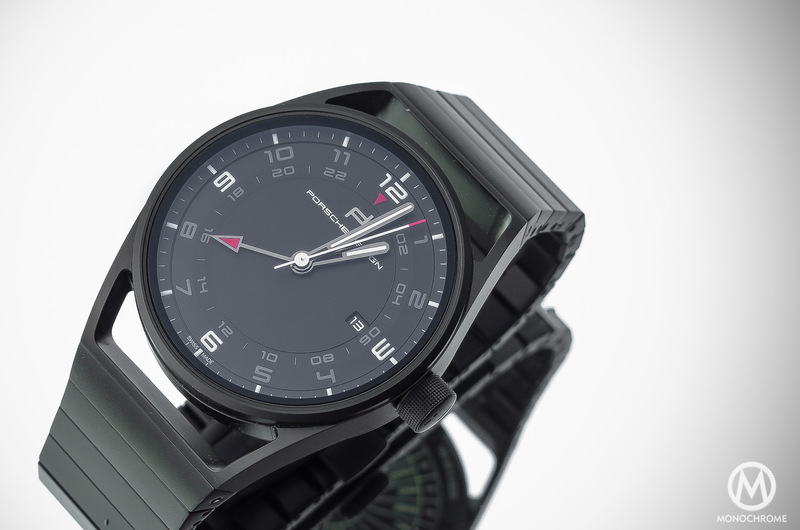 One of the latest, introduced during Baselworld earlier this year, is the Monobloc Actuator 24H-Chronotimer. At first glance, this new model looks somewhat similar to other chronographs in the brand’s current line-up but then you take a closer look and realise something is missing: where are the pushers for the chronograph? The answer, of course, is that they have been cleverly integrated into the case itself, which in and of itself is rather impressive. Not that this is the first time Porsche Design has pulled of such an illusion. 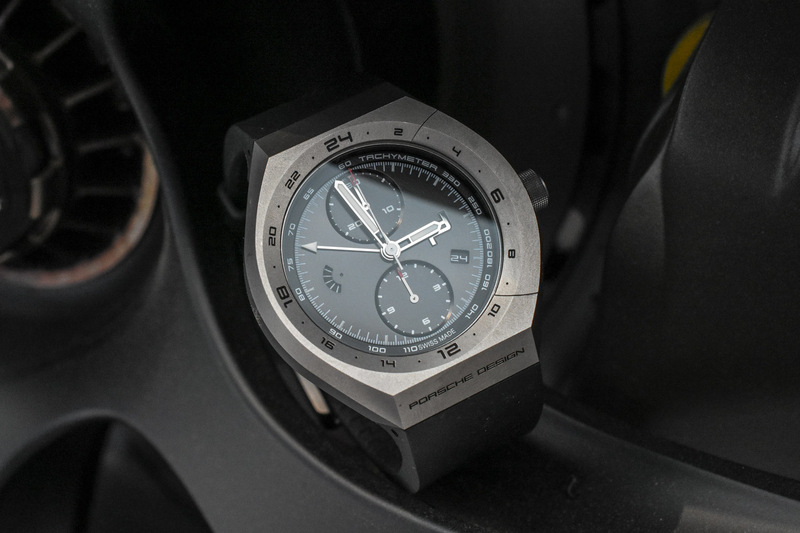 Remember that titanium chronograph I mentioned earlier, the world first? Well, that was called the Titan chronograph and it also featured, you guessed it, chronograph pushers integrated directly into the case. Although that design wasn’t anywhere near as sophisticated as what we have here today. 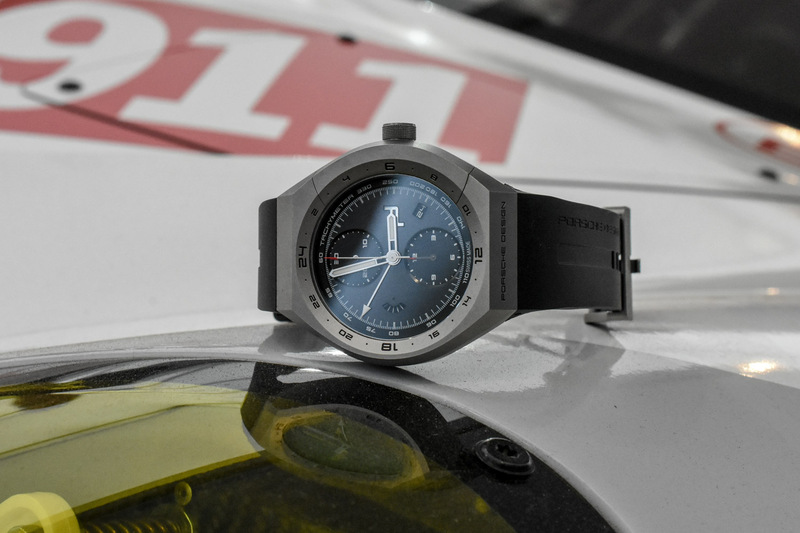 According to Porsche Design, the unique, integrated design of the new Monobloc Actuator 24H-Chronotimer was inspired by the functionality of the mechanical valve control of the new Porsche 911 RSR. 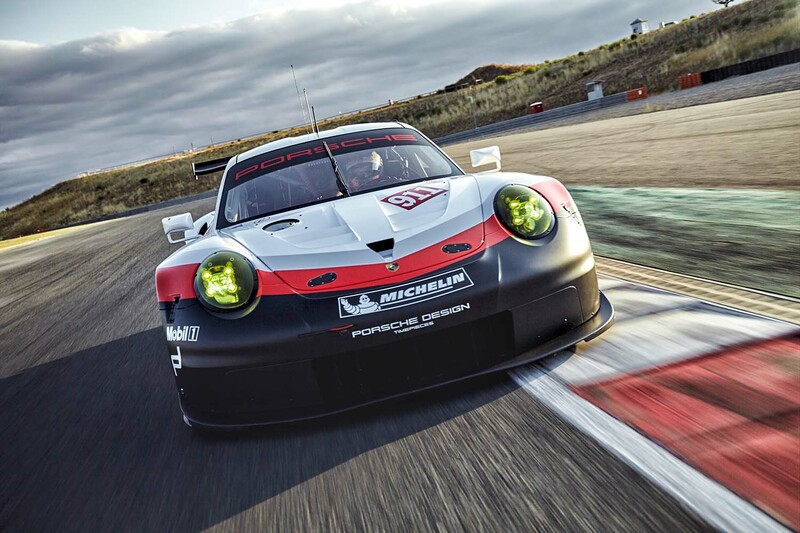 The 911 RSR is the very first 911 that comes with a flat-six engine positioned in front of the rear axle, whereas every other 911 ever has always had the engine positioned behind the rear axle, so this new engine is kind of a big deal. 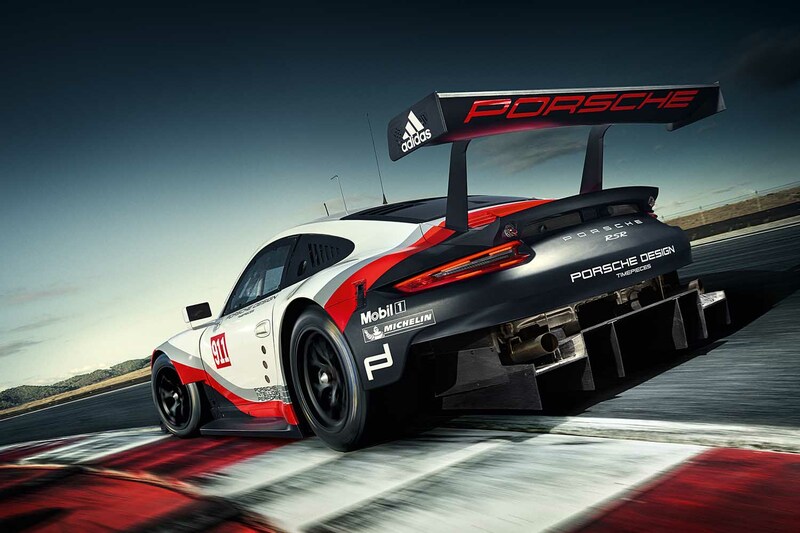 As a fun side note, Porsche Design became the official timing partner of Porsche Motorsport in 2017, hence the very cool new 911 RSR is adorned with the Porsche Design name and logo. This may all sound like marketing hyperbole but it’s important to remember that the relationship between Porsche and Porsche Design goes deeper than just a shared name. Porsche Design has always been inspired by Porsche in motorsports and in fact the development of the integrated rocker switch for the chronograph was only made possible thanks to the collaboration of the watchmakers of Porsche Design Timepieces AG (Switzerland), the designers of Studio F. A. Porsche (Austria) and the engineers of the Porsche Research and Development Center (Germany). The result is an integrated rocker-style switch, which controls the chronograph’s operation entirely from inside the watch’s case. 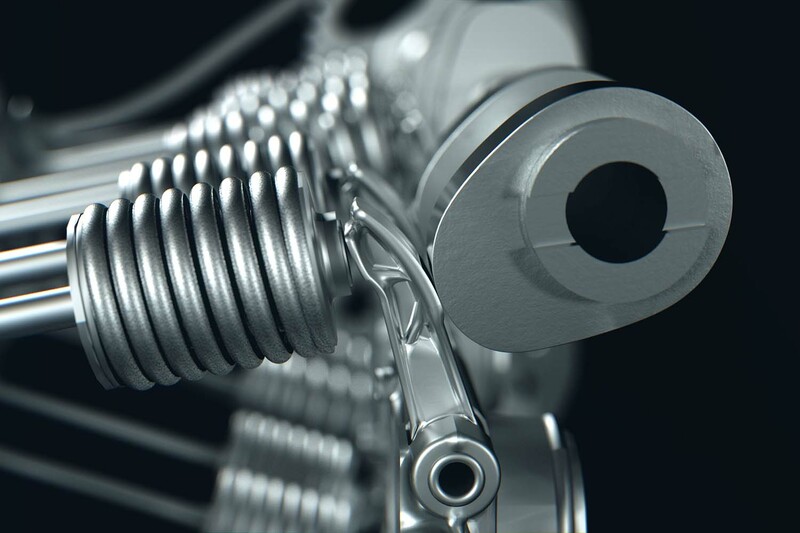 What that means is that unlike previous integrated pusher designs from the brand, which featured dual pushers on either side of the crown, this new watch only uses a single pusher which pivots on a hidden rocker. It’s a little confusing at first but once you get the hang of it, it’s a lot of fun to use and the movements required to start, stop and reset the chronograph feel very natural. I will admit though that it was a bit disconcerting at first when the side of the case seemed to collapse in on the dial but then it made a very satisfying ‘click’ sound and popped back out into its original position. Plus, it’s immensely fun to watch the looks of amazement on your friends’ faces when you appear to crush super-strong titanium with only the strength of your finger. 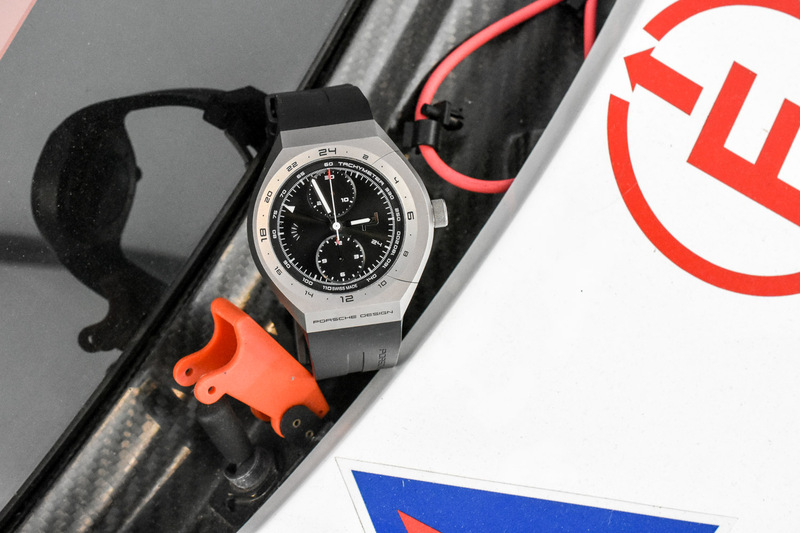 It’s not hard to see that the new Monobloc Actuator 24H-Chronotimer takes a lot of its design cues from the original Porsche Design Titan chrono from 1980, as well as its faithful recreation some 30 years later, the Porsche Design Heritage P’6530. All three watches featured titanium cases, chronograph movements and integrated pushers. Those earlier models, however, were more ‘sports’ watches, whereas this new version is very much a tool watch. At 45.5mm in diameter and 15.5mm thick, there’s no escaping the fact that it’s a big watch but you can also immediately tell that it’s been built for action. 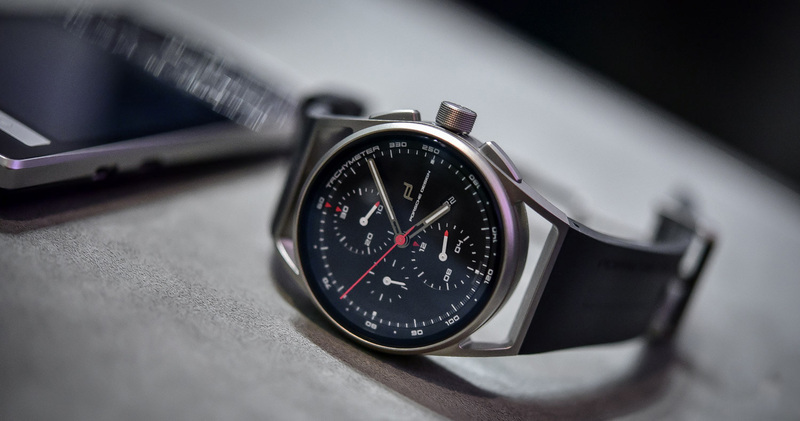 Plus, the titanium case and integrated bracelet mean that it sits nicely on the wrist and is nowhere near as heavy or bulky as it may first appear. 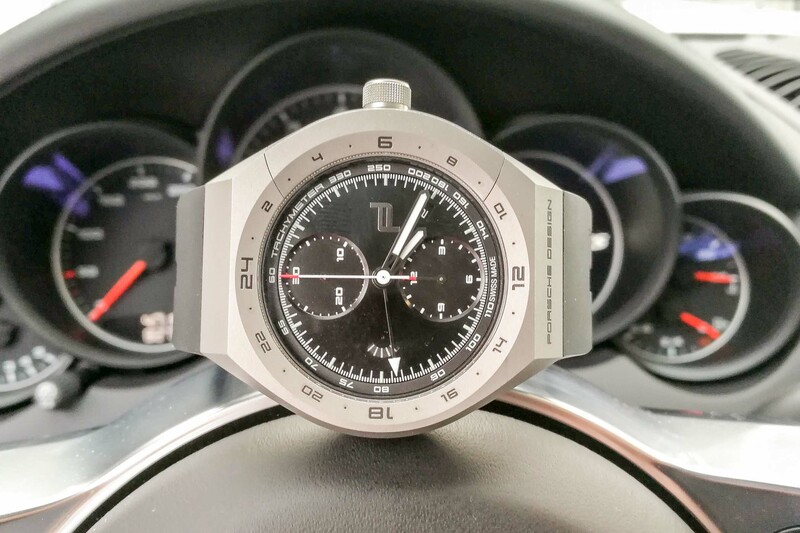 As we’ve come to expect from Porsche Design, the dial is very clean, with the focus primarily on legibility. The running seconds have been downsized to disc with radial stripes that is visible through a small aperture located at 9 o’clock. The goal here is not accuracy but rather to give you a ready indicator that the watch is running, and it achieves this quite well. For the chronograph indications meanwhile, there the two sub dials at 12 and 6 o’clock, displaying 30-minute and 12-hour counters respectively. The clean dial makes it easy to focus on these totalizers, as well as the tachymeter scale surrounding the dial. The central hand with the white pointer is the 24-hour GMT hand, pointing to the 24H scale on the bezel. It not only allows you to read the time in a second time-zone, but you can also set it to your own time, and read that in a 24-hour format. 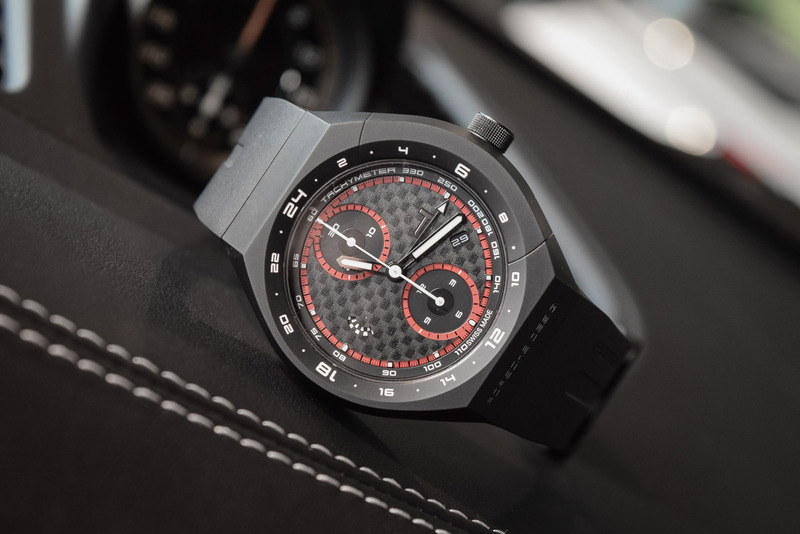 Inside is the ever reliable Valjoux 7754, complete with Porsche Design Icon rotor, which is visible through the sapphire crystal on the back. This automatic movement oscillates at a steady 28,800vph, offering a power reserve of 48 hours. Both the caseback and the crown are screw-down, guaranteeing the entire watch is water resistant to 100m. 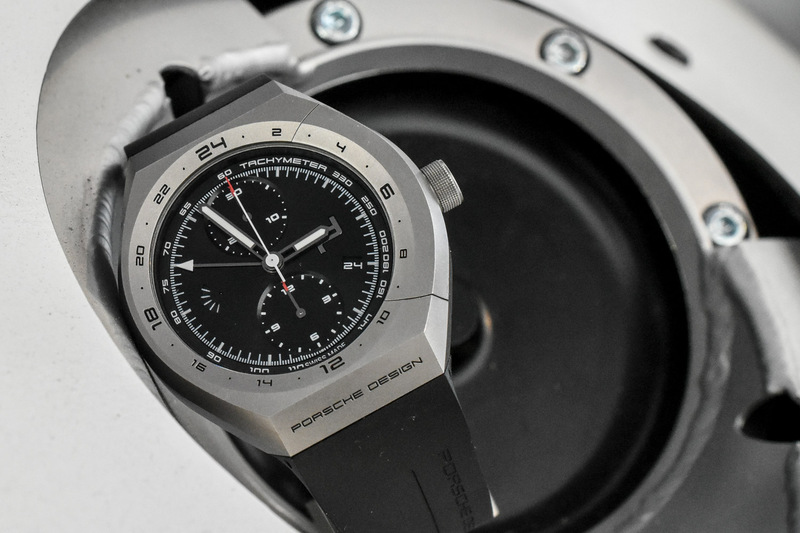 What is perhaps most impressive however, is the fact that Porsche Design have managed to create such a strong seal around the pusher mechanism that you can can actually use the chronograph underwater. I’m not sure if I would be bold enough to test that claim but at least it allays any fears about dust getting into the movement. Offered on an integrated rubber strap or titanium bracelet, it is closed with a titanium and stainless steel folding clasp. 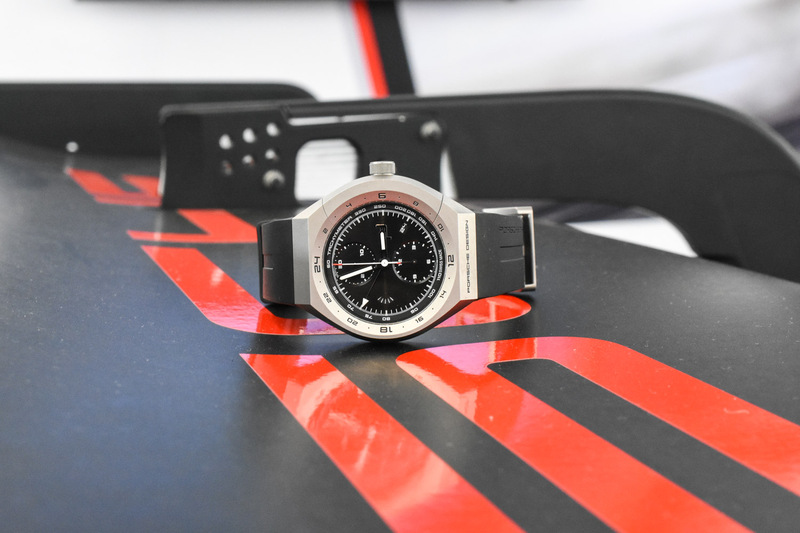 While it may not suit all tastes, or wrists, the Monobloc Actuator 24H-Chronotimer offers yet another excellent example of Porsche Design’s commitment to creating highly technical watches infused with innovations from the world of motorsport and offered at reasonable prices. Very cool indeed.